A small 4 bedroom house with a local character. 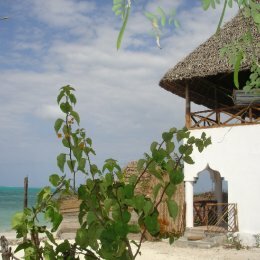 The house is situated on Zanzibar Island, on the very Indian Ocean, on the coast of East Africa. Zanzibar is an autonomic part of Tanzania - the kingdom of safari: wild animals and traveling among them. anzibar, known as the Seasoning Island, is an archipelago of a dozen or so legendary and exotic islands on the Indian Ocean. The house doesn't have a hotel standard, apart from double rooms, every part of the house is for joint use, and in the house there should not be more than 8 persons, with such personality traits as: willingness to understand other culture, tolerance, cooperation in the organization of time and order. There are 4 rooms, 2 bathrooms and a kitchen where the cook bustles about. Everything is very simple, but sufficient enough to rest from the civilization. On the terrace above the house in the makuti shade you can admire the breathtaking ocean view. 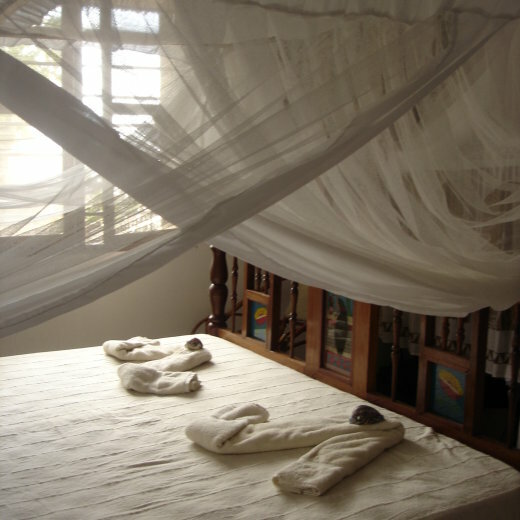 You can spend here whole days reading books, benefiting from local massages, drinking wine, lazing around with no rush. Breakfast is served from 8 to 10 a.m. and includes fruits, fresh juice, eggs (scrambled eggs, omelette - the cook asks which one would you like) or pancakes - and bread, butter, jam, coffee, tea. Dinner is served from 6 to 8 p.m. Enjoy fried, grilled or stewed in sauces: fishes, octopuses, squids, czasa (a kind of shell, similar to mule) with rice, potatoes, sweet potatoes, cooked bananas, manioc (cassava) and different salads (usually with tomatoes, paprika, avocado, papaya, spinach and carrots. You can set a menu with the cook or let him choose the courses for you, from the most fresh products, especially those fished out by fishermen on the same day. In the Jambiani village various bars offer cold drinks, on Fridays or Saturdays music and dance. There is usually a possibility to order beers, dry red or white wine upon request. We had a great time at Vanilla House. Loved it!